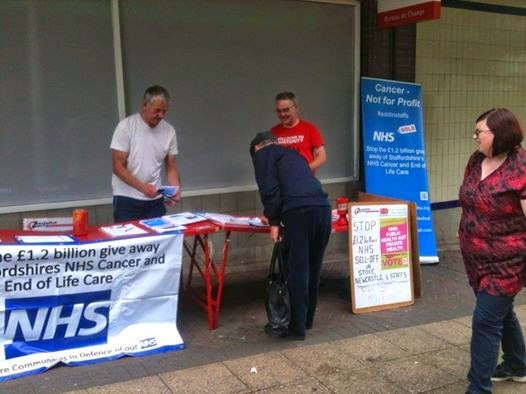 TUSC supporters who were unable to attend today's Cancer Not for Profit pubic meeting in Stafford made up for it by doing a Stop the Cancer sell-off campaign stall in Hanley. Many people stopped to sign our petition and took away TUSC leaflets which explain how we can step up the campaign to stop this privatisation going ahead. This followed on from an even better stall yesterday in Longton where at times people queued up to sign our petition and discuss how we can fight back. In total over two hundred people signed up their support. 99% of those we spoke to agreed with what we had to say about the urgent need to step up the campaign. A majority had no faith in Tory, Lib Dems or Labour to defend the NHS from privatisation.